Second half sub Fabian Herbers scored a fine goal in the 90th minute to keep the Union’s US Open Cup campaign alive after the defense appeared to suffer a narcoleptic episode to give New England the lead in the 44th minute off of a free kick play. The game went to penalty kicks after the scoreline remained level at 1-1 following extra time. A notably weak effort from Sebastien Le Toux — my goodness, what has happened to his once solid PK form? 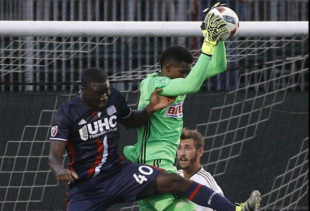 — was soon followed by CJ Sapong’s penalty kick also being saved by former Union man Brad Knighton after the Revolution missed with their third attempt and the Union’s Open Cup run ended with a 4-2 penalty kick defeat. The Union’s decent run in this year’s US Open Cup underscores the team’s belief in the importance of tournament, something that shouldn’t be undervalued. It’s a shame the loss after 120 minutes of play will be followed so quickly by Saturday’s road game against Montreal when the Union return to league play, though. Recaps and reports at PSP, Philadelphia Union, Philly.com, Delco Times, CSN Philly, Philly Soccer News, Brotherly Game, Prost Amerika, Vavel, US Soccer, MLSsoccer.com (recap, Union, Revolution), New England Revolution (recap, report, photo gallery), Boston Globe, Worcester Telegram, Sentinel & Enterprise, New England Soccer News, The Bent Musket, ESPN, and SBI. USA Today has a photo gallery. In the other Open Cup quarterfinal games, Chicago knocked off NASL-side Fort Lauderdale Strikers, 3-0, and will face New England in the semifinals. Houston fell 1-0 at home to Dallas in second-half stoppage time. Dallas will face LAG, who came from behind twice to defeat Seattle, 4-2. The semifinals are scheduled for August 9 and 10. The draw to determine who will host the semifinals, and the hosting priorities for the final on September 21, will take place today at 11 am and will be streamed on US Soccer’s YouTube channel. Without question, Curtin has some stiff competition from the likes of NYCFC’s Patrick Vieira and Colorado’s Mastroeni. But those last two names have benefited from rosters stocked with a DP or three. Curtin, with considerable help from general manager Earnie Stewart, has fashioned a side made up of younger, more modest components and has also had to cope with the absence of Maurice Edu and the departure of Vincent Nogueira. But Curtin has helped engineer an impressive turnaround; as a result, he has them poised to make the playoffs for the first time in five years. The quality, the age, the price. We take all those things into consideration [when looking at a player]. We understand that we are in a good place right now. We are actively trying to improve that. But it comes down to the specific player, do we think he can fit now and going forward? The panel in a video discussion at MLSsoccer.com of All-Stars all agree Keegan Rosenberry deserves a look from the USMNT. Chris Pontius makes Goal.com’s list of All-Star snubs. At Brotherly Game, Matt Ralph has a look at 12 young players who could be potential Union Homegrown Player signings. At Philly Voice, Kevin Kinkead has a good list of candidates to replace Peter Pappas as the Union color commentator. We vote Adam Cann. At the Union website, a report on the soccer clinic the Union and Crystal Palace co-hosted with the Boys and Girls Club of Chester. Bethlehem Steel hosts the City Islanders today at 4 pm (YouTube). When the teams met in Lancaster on May 22, Bethlehem, currently eighth in the Eastern Conference (6-6-6), lost to the City Islanders, who are currently in 12th (5-13-2), 3-1. Previews of today’s game at Bethlehem Steel (print, video), City Islanders, and Brotherly Game. The US Soccer Development Academy end-of-the-year awards have been released and several Union Academy players are among those honored. Making the U-15/16 All-Eastern Conference team are defender Rayshaun McGann and midfielder Josue Monge. Making the U-17/18 All-Eastern Conference team is goalkeeper Andrew Verdi. Former Union Academy forward Isaiah Young, now with PDA, was named the Eastern Conference U-17/18 Player of the Year, with PA Classics defender Sean O’Hearn also making the U-17/18 All-Eastern Conference team. A press release from Reading United notes, “Tickets for Saturday’s session are $10 while fans aged 10 or younger are free. Any fan wearing Reading United gear to Saturday’s games will receive a complimentary pass to Sunday’s conference title game. Tickets for Sunday’s game are also priced at $10 with all fans 10 and under admitted free.” More at WFMZ. University of Delaware forward Guillermo Delgado makes the Hermann Trophy Watch list. Penn State’s Megan Schafer (Langhorne, Pa.) also makes the watch list. Former Union Homegrown Player Jimmy McLaughlin scored the opening goal in FC Cincinnati’s 2-1 loss to NYRB II on Wednesday night. ESPN wonders if his goal celebration was the worst ever. 16,127 fans were on hand for the game, pushing Cincinnati’s home attendance total for its debut season to 164,109, breaking the record of 158,516 set by Sacramento Republic last season with five home games remaining to be played in the 2016 regular season. So far, Cincinnati is averaging 16,411 fans per game. Vancouver has acquired Fabian Espindola from DC in exchange for general allocation money. Colorado Rapids have loaned forward Conor Doyle to USL-side Colorado Springs Switchbacks. WFPL has an update on the coming release of a $75,000 study on the feasibility of a new soccer stadium in Louisville. The New York Times reports on IFAB three-day workshop at Red Bull Arena, “one of the first live tests of a proposed video replay system,” in this case aimed at clarifying the role of the video assistant referee. More at MLSsoccer.com. I’m a bit sad for the Fort Lauderdale Strikers. I was hoping with Chicago being a weaker side that an NASL team would get through. I hate Marsch. He’s a giant baby. Yes, officiating in MLS is a problem, but what right do you have to whine about it when the other team is playing a man down and your own guy (Grella) is completely let off the hook for what could have been an easy straight Red. He just doesn’t want to admit that the Union, in the words of the great Pedro Martinez, are his daddy. I recognize the Marsch issues but the Dark Arts extend beyond the playing field. Why concern yourself with JM… I for one love it. I think the only art he’s engaged in is that of the whine. MLS mid season coach of the year. Really? Call me when this stuff matters. Sports media needs content. Report transfer rumors. Meaningless polls. Top ten list of most incredible back passes. Make sh*t up. The demand never stops. Thank PSP we have Adam Cann. Well considering many people in our community were saying he would by gone by this time of the season, while it is a gimmick, it does offer a small dose of validation of his coaching and the club’s improvement. No? I stopped thinking about it already, sorry. “The reason for this is completely down to the political situation,” the 31-year-old, who scored twice at Euro 2016 as he helped Germany reach the semi-finals, said on his Facebook page. Obviously Adam Cann is the best analyst around, hands down, but I have no idea if he has broadcast presence. You’re on your A game today. I’ve read here and there that Andre Blake is destined for bigger and better things in his soccer career and from his play this year that makes a lot of sense but I dread the thought of him leaving. I know MLS is a single entity and there is some controversy with “solidarity payments”, etc. Who decides if and when Andre Blake can leave? If they sell his rights to a bigger European club, who gets the money? MLS? Union? Does it have any effect then on what the Union can pay other players? First, basically, the team decides if Blake is available. With that said another club can make an offer to MLS / Union at any time transfers are allowed. Once that happens the Union and MLS must agree on a transfer fee. Once that happens, the team gets a decent percentage of the fee and MLS gets the rest. The money the Union receive can be spent any way they choose. On players, fields, debt… whatever. It does not, in effect, allow the Union to have more “cap space”. Pertaining to Blake – my opinion – if he keeps this play up, a European team will make an offer… just a matter of when. Those are good questions and I think the answers are particularly difficult given the single-entity setup of MLS, which has a ton of very difficult to understand rules. MLSsoccer.com’s ExtraTime Radio Pod just had an interview with a guy from fourfourtwo.com who was discussing the possible sale of Orlando’s Kyle Larin. In discussing the rules, he said that the club would keep 50% of any transfer fee if they sold him now. At the end of the season, they’d get something like 66%. And those figures are predicated on Larin’s Generation Adidas status. So the Union (Ernie Stewart) decides when and where to sell Blake. And because the Union really has control over who the team signs and what they get paid (for the most part), yeah, any Blake sale would influence how and what the team plays existing players and new signees. How much money they keep in that sale is something someone who really follows this stuff will have to answer. It is my understanding that any of the money NYRB see on the Miazga transfer to Chelsea comes on the back half of the contract while MLS receives it on the front and the proportions are rather tilted. When Blake wants to go overseas, the league gets the transfer fee to split between LA, Seattle, and NYCFC to allow them to add additional DP’s. All remaining portions of the transfer or loan revenue fees are retained by the league. With league approval, clubs can use the revenue against an expense that would (i) would not otherwise have been incurred by the club; and (ii) reasonably represents an investment in the league or club (e.g. youth development and training facilities).